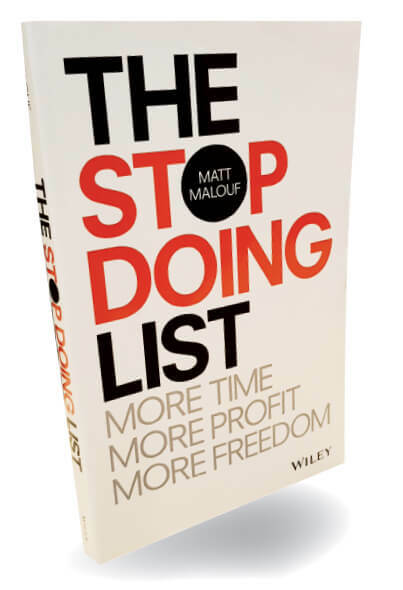 This is a book for control freaks who want to stop being control freaks and free up their time to take up, say, snowboarding or skydiving, or simply to have more time for their families. Business coach Matt Malouf has seen it all. He handholds clients through the process of letting go of some of the things they do (in fact, the bulk of the things they do) that are actually just a lot of busy work that anyone else can do. With the proper training, of course. Malouf says most business owners probably start their businesses to earn more money, have more time and experience more freedom. But the reality soon hits them and they find that they are working longer hours (often 70 to 80 hours a week); sacrificing their social life, health and even family to keep the business running; and earning a lot less. They start to dream of the good old days when they were paid employees and not staying up at night wondering how they were going to meet this month’s payroll. So, he helped Adam identify all the tasks he was performing at less than his calculated hourly rate and assisted him in hiring a part-time virtual assistant in the Philippines named Sebastian whose hourly rate was US$7. By being free of those niggling tasks, Adam managed to double the size of his business and cut 20% of his workload within 12 months. He is now able to focus on more income-producing tasks. Malouf points out that there is a common misconception among business owners that working harder would make them more successful. “I don’t know where they learnt this. When you look at successful businesspeople, the opposite is most often the case,” he says. The problem is that most company founders have difficulty letting go of things. They have no clue about implementing proper systems so that others can replicate what they are doing, or how to find the right people for the job, or even how to go about training them. And most of them are unwilling to take the time to learn these necessary steps and do them. Malouf lists the four major negative mindsets of overworked CEOs — fear that the job won’t be done well enough, the unwillingness to give up control of tasks, the perception that getting someone else to do it will be too expensive, and that there will be no time to implement a system that will allow someone else to do the tasks. He takes each mindset apart and points out the fallacies behind them. For instance, he thinks the inability to relinquish control just because the other person may not be able to perform the task well is about the lamest excuse he has ever heard. “You need to understand that most of what you do is not unique and many of these tasks can be done by others,” says Malouf. But as the odds of having a negative experience with virtual assistants are quite high, Malouf thinks it is better to have the recruitment done for you. He recommends Virtual Angel Hub, which was responsible for the recruitment of his virtual team. He says the team there has the expertise in finding the right types of virtual assistants and training them to do the tasks. They also train you to work with these assistants. The book is littered with concrete suggestions like these. For instance, when you are going to delegate a task, you need to train your assistants. Most CEOs do this cursorily, almost setting them up for failure, which would only serve to reinforce their original misconception that if you want a thing done right, you have to do it yourself. Malouf provides a detailed plan of how to train a person as well as how to reinforce the training and measure progress. A scoreboard is important. Accountability and keeping track of what is happening through regular meetings or timely reports are also important. “Slow down to speed up. Trying to teach too many things at once will inevitably lead to failure and cost you more time and money in the long run. Train your people in one or two skills at a time. Allow them to practise to the point that they can complete the task 70% to 80% as well as you can. Then move on to the next skill,” he says. When training, continual reinforcement is key. A common mistake is to spend too little time on training and assuming that the employee has understood all of the material and can now work independently. Most of the time, they will need to go back and refer to what they were taught. To make this easier, Malouf recommends documenting the process in as much detail as possible so that someone with no knowledge of the task can follow the steps and perform it. “The best way is to actually perform the task yourself and write down each step along the way, like a recipe. You need to identify whether the team member needs a particular skillset, information or anything else before taking on the task. Then, list the process step by step,” he says. You can even use your smartphone’s voice recorder app to create training videos or audio recordings so that the team member can watch or listen to the training again. There is a classic time management story about a professor who fills a jar with rocks and asks her class if the jar is full. When they say yes, she proceeds to add pebbles, then sand, and then water, demonstrating that you can always fit more into your day if you manage your time efficiently. Malouf has a different take on this. “Trying to fit more in is not the way to grow your company and will inevitably lead to mistakes, reduced growth and burnout,” he says.